The effectiveness of Aerial Advertising is recognized by advertisers all across the globe. Not only is it a proven medium for targeting beaches and sporting events, it also has become a solid part of many advertisers outdoor advertising strategy for targeting major markets across the world. AirSign Aerial Advertising is equipped and prepared to manage campaigns in individual or multiple markets simultaneously. With its fleet stationed strategically around major cities, AirSign and its industry partners is capable of servicing aerial campaigns just about anywhere. In addition to covering the United States, AirSign is able to provide coverage to many countries worldwide including South America, Asia, Australia, Africa, India, Europe and many more locations. 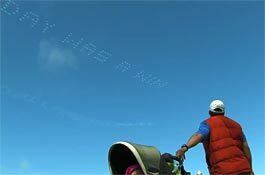 Thousands could be riveted to your message as it flies overhead. One of our primary tasks at AirSign is staying intimate with each market in which we provide coverage.